This group thrived during the last few years of the 19th and early years of the 20th centuries. 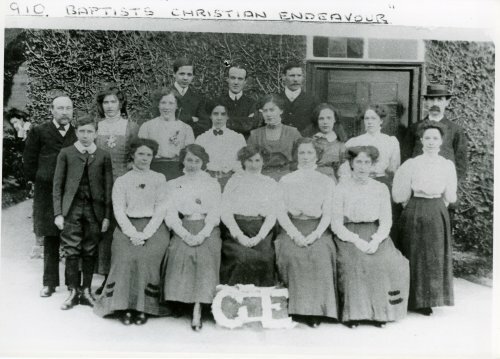 "I believe the young lady fourth from the left in the second row (dark hair and bow at her neck), is my grandmother, Agatha Emily Mary Underhill, known to all as May. In 1919 - ten years after this photograph was taken - she married the Baptist church organist, Wilfrid Ernest Mee to become May Mee. They lived initially on Station Road Quorn and then at 6 Cradock Drive and had four children: Francis Wilfrid (Frank); Eric Lewis (Eric); Charles William (Bill) and Enid Margaret (Margaret), my mother, who went on to become Margaret Allen (Beacon Avenue, Quorn)."